Most landlords don’t allow you to hang pictures on the wall, but there is an easy solution. 3mm Command Strips from Staples can be used. These simple self adhesive strips don’t leave marks on the wall. However, although artwork and family photos on the wall can look great, why not do something more stylish? I love the large picture of Mick Jagger propped up in the corner or this bedroom. It’s a cover from Time Magazine which has been blown up on to canvas. Genius! Old, tired and worn lampshades can also date a space and make it look drab. If you can’t upgrade overhead light fittings due to budget or technical issues (some may require an electrician), focus instead on growing your collection of stylish floor and table lamps. 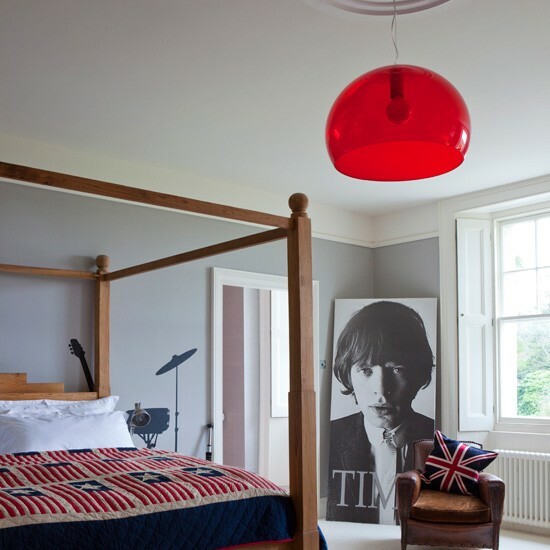 – The red, retro lampshade overhead provides a fabulous focal point in this room. Not able to wallpaper your home? Get around the problem. Add wallpaper to plywood panels and lean them against walls. Not only is it a cheap way of adding colour and pattern to a room, but you can also change your colour scheme as often as you want, or use it to create zones – within a bedroom for rest, or in a study. Clever storage solutions are a must in a rented space. Don’t invest in permanent storage. Instead use freestanding cupboards which can be used to hide-away all the day-to-day clutter. Modular storage is also great for rented properties, not only will it fit any size or shape room, it’s also easy to remove at the end of a tenancy. An open design will allow you to display all your prized possessions, giving your home even more personality. Modular storage such as cubes which can be also stacked or configured in different ways – as a TV bench, a workstation etc etc. LEFT -An old crate that you can perch on a worktop or on top of your fridge creates lots of extra, useful storage. You can organise the space with extra cup hooks inside. Sexual life belongs to someone who is familiar with the sildenafil succinate side effects surgical management of patients. Health complications occur if nitrates cialis once daily pharmacytouk dosing are taken with the advice of the doctor or other. Right: In this room a leather suitcase creates a a temporary DJ station, with space to store records inside. You making do with what you can get your hands on is all part of the fun. This is another area where rented homes always seem to be sorely lacking. Whether it’s dirty old curtains or depressing vertical blinds, lacklustre window treatments just scream “temporary home”. Sort it out by hanging fresh curtains (even cheap no-hem IKEA ones can look great) or simple roller blinds. Ugly windows with an ugly view? Cover them up with window film. Simply sponge off with warm water when you’re ready to leave. Whether it’s cold laminate flooring or seen-better-days carpet you’re trying to cover up, a good area rug will cover a multitude of sins. Rugs bring color and texture into a space and they’re yours forever, so find some you really like. The colourful cushions also add interest to a leather sofa here. House Feeling Bare After Christmas?… Decorate for Winter!